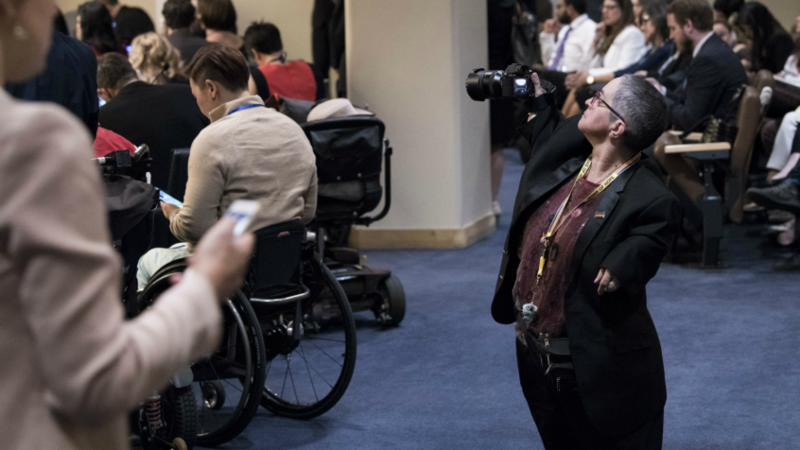 The eleventh session of the Conference of States Parties to the Convention on the Rights of Persons with Disabilities was held at United Nations Headquarters in New York from 12 to 14 June 2018. Six meetings were held at the eleventh session of the Conference. On 12 June, the 1st and 2nd meetings were convened to consider agenda item 1 (opening of the eleventh session of the Conference), item 2 (adoption of the agenda), item 3 (organization of work), item 4 (election of the members of the Committee on the Rights of Persons with Disabilities) and item 5 (a) (matters related to the implementation of the Convention: general debate). Two rounds of elections were held on the same day, in accordance with article 34 of the Convention, to elect nine members to the Committee on the Rights of Persons with Disabilities. Three roundtables were held at the 3rd, 4th and 5th meetings, on 13 and 14 June. At its 6th meeting, on 14 June, the Conference considered agenda item 6 (interactive dialogue among States parties, the United Nations system and other stakeholders on the implementation of the Convention), item 7 (decisions by the Conference of States Parties) and item 8 (closing of the meeting). The text of the decisions adopted by the Conference is contained in annex I. The President’s summary of the session is contained in annex II and the list of non-governmental organizations accredited to the Conference.